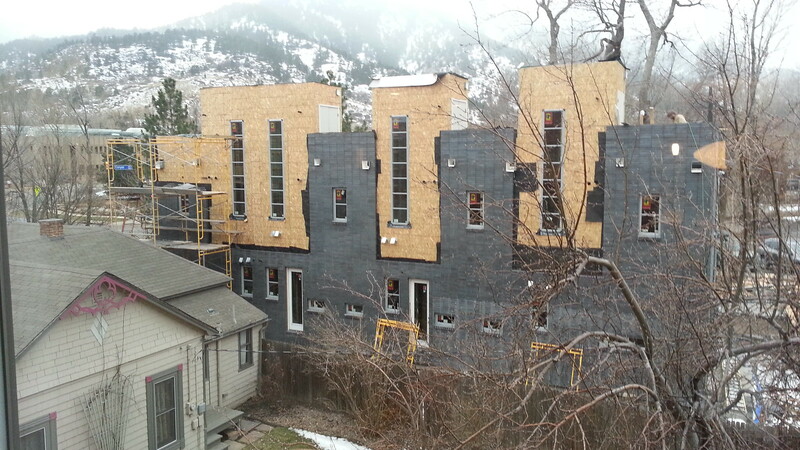 When completed, there will be four brand spanking new residential dwellings in this multifamily building in downtown Boulder. Here's the breakdown: three two bedroom units, one single bedroom unit, plus a carport. The permit places the value of construction at $522,295 plus $25,000 for the carport. The rundown multi-family property was acquired in 2012 for $675,000 and Firstbank stepped up with a loan for $1.9MM. See this old listing for photos and details. Note the potential view. It can be challenging to ballpark luxury rents, but let's look at a few comps and try to triangulate. Solana at Boulder Junction prices two bedrooms at $2,610 and 1 bedroom studios at $1,450 a month. The last time I checked the Residences at 29th Street, 2 bedrooms were priced up to $2,350 and 1 bedrooms started at $1,400 (research note). Solana and the Residences at 29th Street luxury market rentals, but neither are in as desirable a location as 601 Canyon. Looking nearer to the project, The Arette commands astronomical rent - north of $6,000 a month while a more humble 2 bedroom unit in a similar location (without views, not updated) is asking a mere $2,100. I think it's a safe bet that 601 Canyon will have fantastic views and luxury appointments. I'd expect the developer has modeled at least $3,000 per month for the 2 bedroom units and $2,000 a month for the 1 bedroom. For modeling purposes, $11,000 a month for the building is a good (conservative) estimate. The market might support rent as high as $14,000, in my opinion. At an estimated building rent of $11K per month and a project cost of $1.9MM, you're looking at a 6.95% cap rate. A solid return. However, if the $1.9MM represents 80% LTV, the investor has another $475K in the project and cap rate is closer to 5.56% cap rate. Not so great, especially for this location. They'd need to see closer to $14,000 per month in order to hit that magic 7 cap. UPDATE - 2/3/13. Units at 601 Canyon are listed for sale to private owners but all are currently under contract (open to back-up offers). Details are HERE. Bank of Commerce Mortgage is also not involved, according to the developer.